The Indian River Lagoon is the closest saltwater fishing to Orlando and Walt Disney World. Just minutes from Orlando International Airport, the 150+ mile Indian River begins in New Smyrna Beach and stretches all the way towards Stuart moving through areas like Cocoa Beach, Sebastian and Vero Beach. 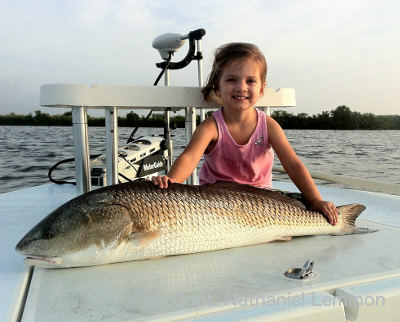 For record size redfish and spotted sea trout, the North Indian River Lagoon is without a doubt the top destination in Florida as both state records were set in the Indian River. The North Indian River Lagoon is also home to the Kennedy Space Center at Cape Canaveral. Millions of people have come to the Indian River shorelines around Titusville to watch space shuttle and NASA rocket launches. The North Indian River Lagoon is bordered on it's eastern edge by the Merritt Island National Wildlife Refuge. Thousands of acres of freshwater impoundments and marsh are heavily managed for wading birds and migrating waterfowl. The Refuge is also home to many alligators, manatees, dolphins, otters, raccoons and many more. Titusville also serves as an access point to the southern end of Canaveral National Seashore. Indian River Lagoon Spotted Sea Trout are world famous. Once again the Florida state record speckled trout was caught in the Indian River and that fish also stands as the world record (over 17 pounds). Trophy size speckled trout in the Indian River grow larger than anywhere in Florida with lengths over 30 inches and reaching over 15 pounds. The Lagoon provides excellent sea grass habitat with lots of food to grow supersize gator trout. World class spotted sea trout over 10 pounds in the Indian River Lagoon are routinely caught throughout the year by fisherman using live bait, soft plastics and plugs. Capt. Lemmon has a fantastic picture gallery of trophy Speckled Trout caught on his charters. The North Indian River Lagoon’s redfish are the highlight of any fishing charter. The Florida state record redfish was caught in the Indian River and so were many redfish line class records. Fisherman come from everywhere for a chance to sight fish schools of trophy size bull redfish on the Lagoon’s deep flats. Indian River Lagoon bull redfish will school by the hundreds in the summer. These giant bull redfish will range from 20-50+ pounds. Sight fishing for the bull redfish in the North Indian River Lagoon is possible year-round. Check out many of the trophy redfish pictures that Capt. Lemmon has accumulated from over 1,000 charters. You will encounter more Indian River Lagoon snook as you venture south. Snook prefer the warmer waters found year-round in the southern portions of the Indian River. The Lagoon’s deeper mangroves, inlet, dock and bridge structures provide excellent snook habitat with trophy fish weighing over 20 pounds. Tarpon in the Indian River Lagoon are also found throughout the year. During the summer, tarpon over 60 pounds move into the Lagoon’s Inlet’s down the Florida east coast. Juvenile Indian River tarpon from 5-20 pounds are often found in small creeks, residential canals, and freshwater rivers that drain into the Lagoon. Fishing for speckled trout and bull redfish in the Indian River Lagoon is the focal point of most fishing charters. The potential for world records in the Lagoon bring hundreds of thousands of people to the area annually. Clear grass flats allow light tackle fisherman to use a variety of live baits and lures to have success sight fishing schools of redfish, laid up speckled trout, black drum and more. Fly fishing charters on the Indian River are popular because many line class records for redfish and spotted sea trout were set here. Fly fisherman find success casting baitfish streamers. The Indian River shorelines are more residential allowing anglers to have success for redfish, trout, snook and tarpon under the dock structures. Capt. 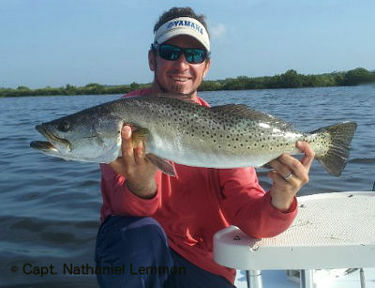 Nathaniel Lemmon has fished the Indian River Lagoon for many years and is seasoned on finding trophy size fish. Read his monthly updated Indian River Lagoon fishing reports for areas around Titusville and Cocoa Beach. To fish the Indian River Lagoon with Capt. Nathaniel Lemmon, charters originate from one of several boat launch locations on the river’s west shoreline in Titusville, Mims or Cocoa Beach.